In a medium saucepan, cover the barley with 6 cups of cold water and bring to a boil over high heat. Reduce the heat and simmer until tender, about 1 hour. Drain the barley and let cool. Bring a medium saucepan of water to a boil over high heat. Add the shrimp and cook for 30 seconds after the water returns to a boil. Drain the shrimp and let cool. Season with salt and black pepper. Fill the saucepan with fresh water and bring to a boil. Add 1 teaspoon of salt and the beans and boil until just tender, about 5 minutes. Drain the beans and rinse under cold running water. Drain and pat dry. In a medium bowl, whisk the olive oil with the lemon juice, 1 1/2 teaspoons salt and 3/4 teaspoon black pepper. Stir in the shallots and lemon zest. 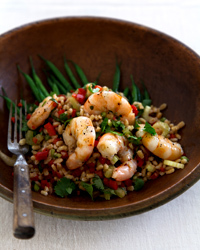 In a large bowl, toss the barley with the shrimp, celery, red and green bell peppers, basil, and cilantro. Add the dressing and toss. Mound the salad on plates or a platter. Toss the beans in the dressing that clings to the bowl and season with salt and black pepper. Garnish the salad with the beans and serve at room temperature. The barley can be refrigerated for up to 1 day. Let return to room temperature before proceeding.